CM Magazine: Love is a Four-Letter Word. Love is a Four-Letter Word. "...I was looking for Benji." "He's not here. He had to go to the theatre for something or other." The Dentonator grunts. "That's what he said. I figured you were with him. Didn't you know? Well?" I'm so caught off guard it takes me a moment to realize that the Dentonator is staring at me, waiting for me to say something. "I'm not sure, Mr. D. He never mentioned anything about the theatre to me." The Dentonator frowns. "Huh? I thought you two were attached at the brain." Clarissa Delaney is back in Vikki VanSickle's Love Is a Four-Letter Word, a sequel to Words That Start With B. Her mother has recovered from cancer. Life seems to be back on track for Clarissa, but there always seem to be drama in her life. This time, Clarissa auditions for the school play, The Wizard of Oz, and convinces her best friend, Benji, to audition with her. The audition begins well, but when Clarissa is asked to sing in a different key, her voice becomes "thin and reedy." Clarissa knows she will not be a part of this school play, but to her amazement, Benji is given the part of the Cowardly Lion! Clarissa is devastated, but she tries to be happy for Benji. As rehearsals start, Benji makes new friends and becomes busy with rehearsals. Clarissa feels left out, alone, and even a bit jealous. Even though she still has her new friend, Mattie, it is not the same as spending time with Benji. The other dramas in her life include her relationship with her mother, her mother's personal trainer and the "possible" boy in her life, Michael. As most children and teenagers would, Clarissa feels weird when her mom starts to love someone else. The most awkward moment of her life is having an unexpected double date with her mom and her mother's new boyfriend, Doug, while Clarissa is out with Michael. Clarissa is unsure whether she likes Michael, but she finds out that they are a really good team when it comes to badminton. As her friendship with Michael develops and she gets to know Doug, she realizes her hidden talent for sports. Through these relationships, she learns what love really means. Love may be a four letter word, but it is not as easy as it seems. Love is a Four-Letter Word shows the worries of a girl who feels like she's losing her mother and her best friend to other people. Clarissa always thought she was the most important person in their lives. She couldn't understand why she wouldn't be enough for her mother and Benji. She struggles to maintain these relationships, and through VanSickle's humourous use of language, readers can watch how Clarissa learns to love. 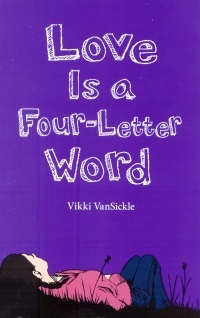 Like Words That Start With B, Love Is a Four-Letter Word continues to provide an honest outlook of a pre-teen figuring out her relationships and the world around her. Some of the issues in here are appropriate for book clubs and mother-daughter discussions. Alicia Cheng is a Children's Librarian at Vancouver Public Library in Vancouver, BC.